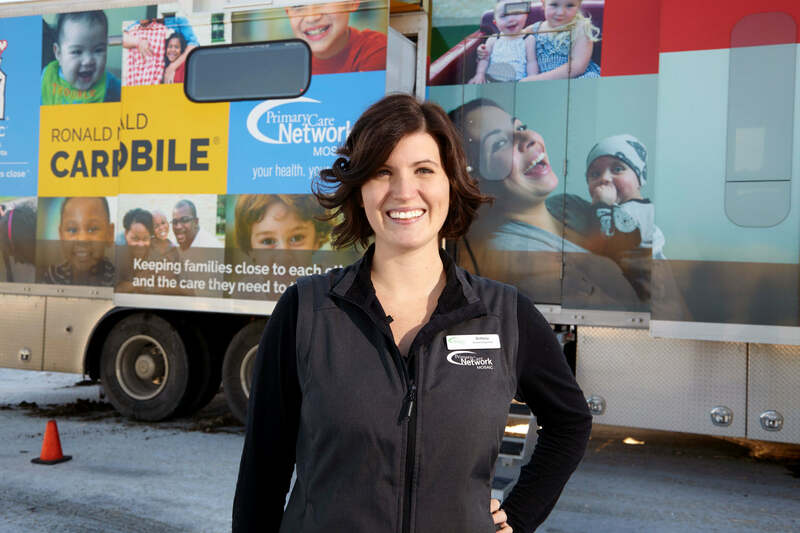 Your family doctor’s clinic is your medical home—a place of care that you turn to first for health support. 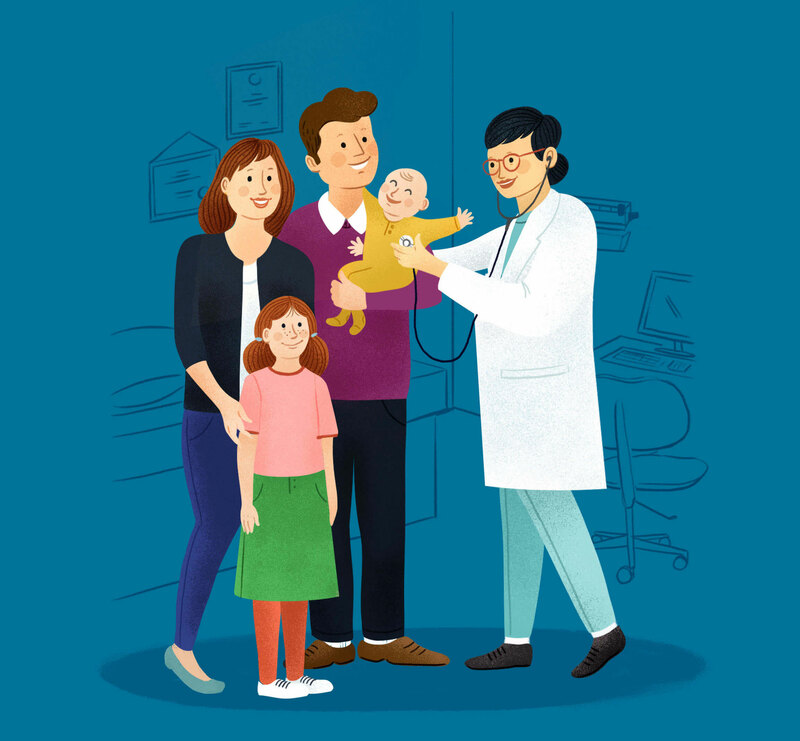 It’s where your doctor connects you to the care you need, when you need it. Through Primary Care Networks, your medical home is backed by a team of healthcare professionals. Depending on the support you need, your doctor can provide access to a dietitian, social worker, kinesiologist and other healthcare providers. Speaking with your doctor is the best way to find out what supports are available and determine your course of care. Plus, by visiting your family doctor regularly, you’re more likely to have better health overall, receive better care, make fewer visits to the emergency room and be hospitalized less often. 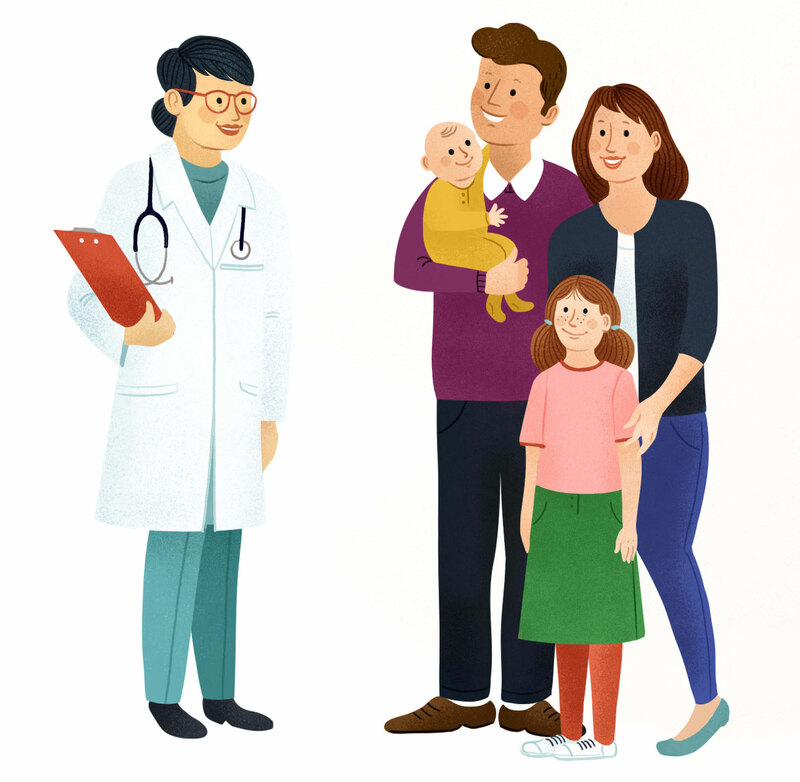 Visiting your family doctor is the first step to good health, whether it’s for a regular checkup or to talk about a particular concern. By getting to know you and your medical history, your doctor can give you informed medical advice and treatment. As well, your doctor can connect you to other healthcare professionals if you need them. They can also help you proactively manage your health in order to prevent illnesses and diseases. and postnatal care, as well as nutritional guidance and mental health support for moms, dads and babies. Health professionals, such as registered nurses, help you learn about caring for your newborn; many are also certified lactation consultants, ready to assist with breastfeeding. Dietitians help with healthy food choices for both parents and baby. Registered nurses (RNs) work closely with family doctors and other health professionals to support you through all stages of growth and development, and degrees of wellness and illness. They help with assessing, screening and determining health concerns, as well as setting achievable health goals. RNs can answer your health questions, offer support for treatment and make it easier to manage a chronic disease. A chronic disease is a long-term illness and understanding it is essential to living with it. If you have a chronic disease such as high blood pressure, high cholesterol, diabetes, asthma or obesity, you play the most important role in managing it. Your healthcare providers play strong supporting roles. Along with your doctor, a team of registered nurses, dietitians, kinesiologists, pharmacists, occupational therapists and social workers can work with you to create a tailored treatment plan, and help you stick to that plan. Pharmacists help by explaining what your specific medications do and how to take them. They can also help with monitoring blood sugar and blood pressure, and interpreting the readings. Pharmacists also ensure that your medications work effectively for you, and advise on side effects and drug interactions. For instance, they can determine what’s safe for you to take for a cold or a stomach ache—including natural remedies—that won’t interact with your insulin or blood pressure medication. Dietitians create healthy meal programs to fit your lifestyle and foods you like to eat. They help you learn which foods have important nutrients, understand portion sizes, read food labels and shop for healthy foods. 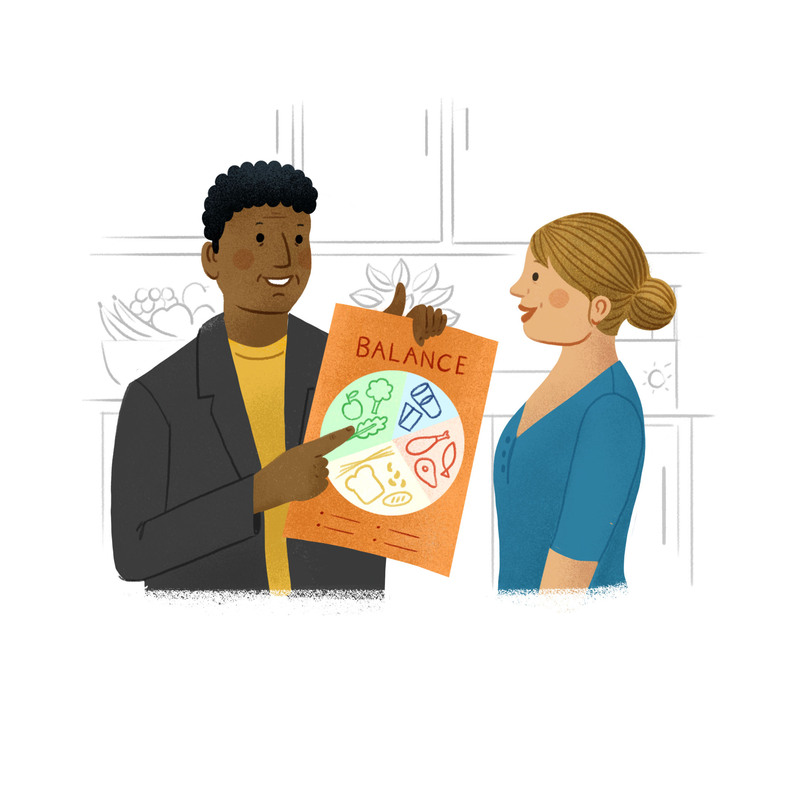 By helping you better manage what you eat, dietitians can help reduce the risk of high blood pressure, high cholesterol, obesity and malnutrition. They can even help prevent Type 2 diabetes through diet and exercise. Making healthy eating and activity part of your daily life improves overall health and prevents disease. Healthy eating for the whole family begins at home, but needs to also extend to work, school and play. Same goes for physical activity. Dietitians help you develop meal plans that provide nutrition, but also fit into your lifestyle. They can also help you understand food labels and learn how to choose healthier foods. Kinesiologists and occupational therapists teach you exercises that focus on improving overall physical function throughout your life. They can help you overcome and prevent injury, and self-manage physical health and wellness. Kinesiologists (may also be called exercise or fitness specialists) are movement experts who help prevent and manage injury and chronic disease. They can also help you reach your physical health goals. They create exercise and strength-training programs for you to get and stay fit. Kinesiologists also help reduce time lost after an injury. Mental health is made up of your physical, mental and social well-being. Like physical health, mental health is fluid and changeable. We all go through times of stress and how we cope during those times varies. Mental health therapists, social workers, counsellors, psychologists and pharmacists are some of the professionals available to support your mental health. These professionals help you to better cope when it comes to stress, anxiety, depression, poor sleep and grief. Social workers help you solve problems by helping you get the information and resources you need, such as community support programs. They provide assistance for seniors, family dynamics, respite, grief, mobility, living arrangements, in-home supports and more. A social worker can act as your advocate and help you to navigate the healthcare system. 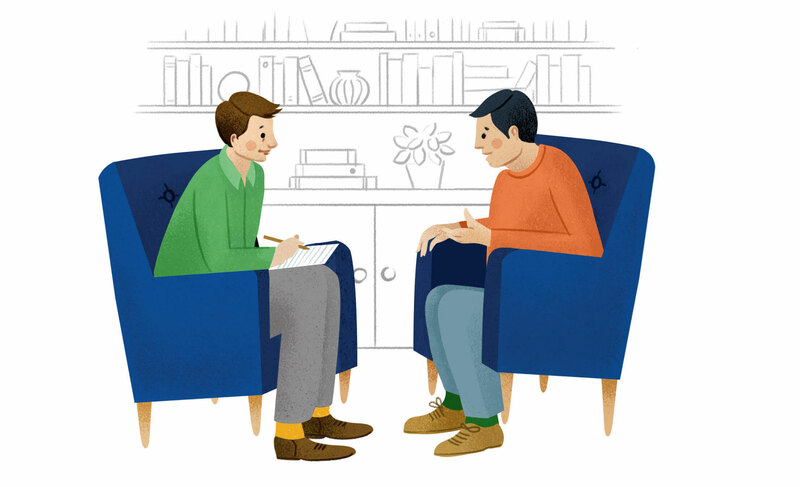 A mental health therapist (who could be a psychologist, counsellor or behavioural health consultant) listens and discusses issues with you to help deal with life’s challenges. These challenges include relationship issues, parenting, depression, stress, anxiety, pain management, trauma and substance abuse. Mental health therapists focus on improving your overall health, and help you cope emotionally when living with a disease or caring for a loved one. They also help with methods for sticking to treatment plans.